It was as basic as it comes no kettle, tv or any mod cons in fact dont think you could call it self catering. Waited two days for them to give us a teaspoon as none in room. It was near to everything you needed. Pool very run down but maybe it was classed as out of season. Would go again to resort but different apartments. We have been to the Sand Club Apts. Twice a year for the last 3 years and each time we go they seem to be more run down than the last time.But we will still return. On this occasion we were allocated a 2 bedroom apt which we asked for. However, it did not have a tv and the balcony furniture was stained and broken. We asked for replacements which we received 2 days before our departure. We choose to stay here because of it's location. It is a short walk from The San Blas shopping centre which has a variety of bars and restaurants. It is also a 2 minute walk to the sea where my husband enjoys sitting on the rocks and fishing. Yes, there is no beach, but the apts. have a lovely pool with plenty of sunbeds. It is also within walking distance of a fabulous golf course/crazy golf/ tennis complex. The staff at the complex were more than friendly and tried to help whenever they could. Would I stay here again? Of course I would. It is a great place to stay for the money you pay. The apts. are spacious with a large balcony/ terrace and the best supermarket I have ever seen abroad is a 2 minute walk away. There are no lager louts and not many kids so I would reccomend this place to couples who want a quiet week away from it all. 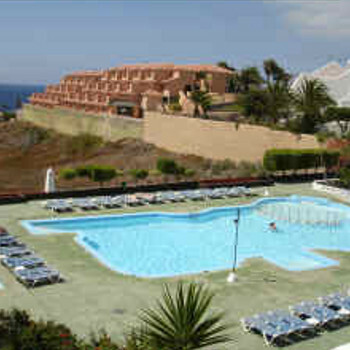 We statyed in the Sandclub apartments, which are located in the Golf del Sur region of Tenerife. The apartments are not near a beach (nearest decent beach Los Christianos - 15 klms away!). The apartments are mostly privately owned and although there are notices all around to say no pets almost everybody had one. We were unfortunate enough to get an apartment next door to a dog that barked consistently anytime you went outdoors. The apartments are on the direct flight path to the airport which means there is constant aircraft noise. The apartments were very clean and spacious (we had a double bed which was fine). Lots of cutlery/crockery, microwave, cooker and a tv and safe deposit box. The staff spoke very little English so it was almost impossible to make ourselves understood. Have just returned from a week at the Sand Club. We arrived at 0530 hours (brilliant!) and although I had telephoned the day before to make sure that we would be expected (quite important at that time in the morning! ), and having been told that they have a 24 hour Reception. The reception was locked, and a note on the door gave a number to phone. I was unable to get through on my mobile (due to code?) so went down the road to a pay phone, phoned the number (though I couldn't see in the dark), and got through to an answer phone! Though I couldn't understand the Spanish message, I asked for someone to come to let us in, and a few minutes a young man wandered along! Anyway, apartments fine, though very basic (only three electric rings for cooking, not four, and no cooker/microwave). The terrace was filthy (I think the apartments had been empty for a few days, and it may have been raining). Apartments not cleaned all week, and only a change of towels on day 6! Don't forget mosquito machine/repellent, as these were a problem at night.